With everything that’s been happening in the news lately, perhaps it’s inevitable that I’ve had fear on my mind. Not that I’ve been constantly afraid, but rather that I’ve been thinking about fear itself. 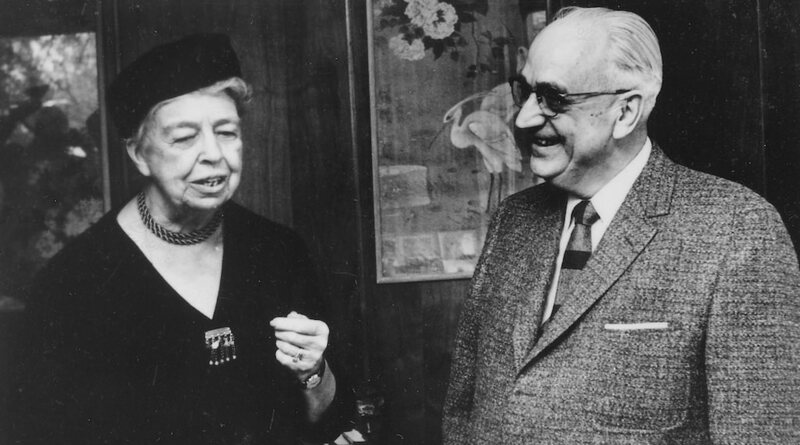 Dr. Karl A. Menninger with Eleanor Roosevelt. Both were champions of standing up to fear. What does exactly does this mean? I’m certainly no psychiatrist, but if I understand Dr. Menninger correctly, he’s pointing out that many of our fears were taught to us—not by nature, but by other humans. *OK, these in themselves might be terrifying. Growing up, parents, teachers, religious leaders, and politicians educated me on what to fear. And I trusted them simply because they had authority. It wasn’t until I started to explore life on my own terms that I began to see the error of my ways. I realized that many of the alleged truths I’d been told by others were nothing more than opinions—faulty one’s at that. 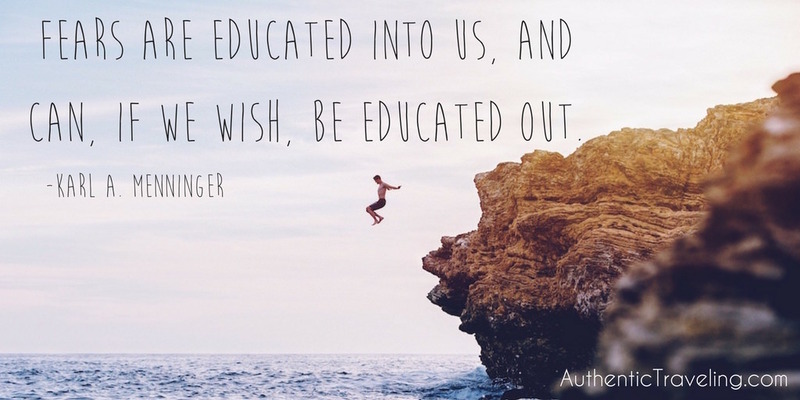 Much of my re-education about the world has come about through travel. I’ve been fortunate enough to visit some incredible places and meet some fascinating people. Through this I’ve seen that the vast majority of people around the world—regardless of race, religion, or politics—want the same things: to feel loved; to be able to protect their family; to have a sense of purpose. I still remember the discussion I had with a man from Afghanistan at a bar in Perugia, Italy back in 2013. Over the course of an evening, we spoke about how the conflict in his home country had affected both of us, and what we hoped would happen in the future. As the night drew to an end, we realized that we shared way more in common with each other than we could have imagined. Of course something dreadful could happen on my next trip. I could get blown up by a bomb in a train station. I could get run over by a car while crossing the street. I could get taken hostage by extremists. I could also have a stroke while watching baseball on my couch. My point is that so many of the fear-inducing narratives we’re told these days are at best exaggerations and at worse complete falsehoods directing us away from the true dangers in life. And so it’s our choice as to whether or not we chose to absorb these lies and live in fear or proactively seek the truth. Travel is by no means the only way out of this trap. Advances in technology have made it easier than ever before to connect with others and learn about the world. Still, nothing quite compares to the act of literally facing the people and places you’ve been told to fear.